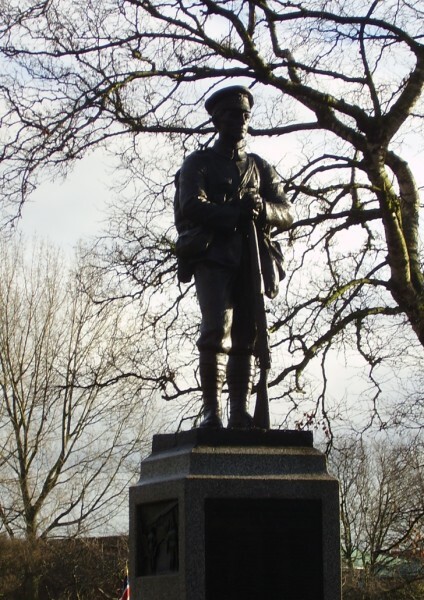 The Memorial is situated in the centre of Heath Town Park, opposite the main gates on Church Street. The soldier is made of bronze and stands on a granite base. The figure was created by G.A Walker circa 1920. Son of George and Annie Blanche Addison of Ruardean House Cannock Road Wolverhampton. Grave Reference: Plot 1. Row B. Grave 3. Son of Mrs. Agnes Andrews of 18 Chapel St. Moseley Village Willenhall. Son of Mr. and Mrs. J. Anslow of 30 Woden Rd. Heath Town Wolverhampton. Grave Reference: OG. 36. 60. HEATH TOWN (HOLY TRINITY) CHURCHYARD. Born in Wolverhampton, enlisted at Aldershot. Grave Reference: V. D. 9. Son of Isaac and Hannah Astbury of 254, Prestwood Rd. Heath Town. Grave Reference: VII. E. 18. Son of Edward and Clara Bagnall, of 34, Cannock Rd., Fallings Park, Wolverhampton. Grave Reference: III. B. 64. Son of James and Gertrude P. Baker of 6 Crowther St. Park Village Wolverhampton. Grave Reference: NG. 3. 11. Grave Reference: II. A. 18. Son of Mr. and Mrs. Beddow; husband of Louisa Beddow of 919, South Campbell Avenue, Chicago, U.S.A. Son of Joseph and Maria Bell of 34 Leslie Rd. Park Village, Wolverhampton. Born and resident in Wolverhampton, enlisted at Liverpool. Son of the late John Thomas and Elizabeth Emily Bestwick. Pier and Face 1D 8B and 8 C.
Born in Wolverhampton, resident and enlisted in heath Town. Son of William and Mary Ann Bills, of Moseley Village, Heath Town; husband of Martha Helen Bills, of Newbold Villa, Deans Rd., Heath Town, Wolverhampton. DOULLENS COMMUNAL CEMETERY EXTENSION No.1. Born at Stewponey, Kinver. Son of James Clarson Bird and Mary Louisa Bird, of Wolverhampton Rd., Heath Town, Wolverhampton. Grave Reference: I. B. 3. Born in Heath Town, enlisted at Bilston. Grave Reference: I. E. 49. 7th (Service) Bn South Staffordshire Regiment. Born and enlisted in Wolverhampton. Born in Cotton Staffordshire enlisted in Heath Town. Husband of Muriel Jessie Booth, of 70 Wolverhampton Rd. Heath Town. Killed in Action 17August 1917 age 32. 1st Bn. South Staffordshire Regiment. George was born in Shifnal on 6 January 1890, the son of George and Harriett Bowen. He became an engine cleaner with the Great Western Railway on 9 July 1906. He married Alice Evans in Wolverhampton in 1910. The couple had a daughter, Norah, in 1912. On 9 July 1910, he enlisted with the Royal Navy He became a Stoker First Class on HMS Hampshire. On 5 June 1916, the ship struck a German mine west of Orkney, and sank, killing all but 12 men on board. An article in the Express & Star on 14 June 1916, gives his address as 28 Prestwood Road, Wolverhampton, which is why his name appears on this memorial. The Royal Navy record Alice’s address as 2, Carlisle Road, Southsea, Hampshire which means she would be living close to where the Royal Navy ships were stationed in Portsmouth. Memorial reference: 17. PORTSMOUTH NAVAL MEMORIAL, Hampshire, United Kingdom. "C" Bty. 277th Bde.Royal Field Artillery. Son of Sidney and Sarah Bradburn, of The Nook, Bickford Rd., Fallings Park, Wolverhampton. Killed in Action 20 September 1917 age 24. Panel 4 to 6 and 162. Born at Douglas, Isle of Man, enlisted in Wolverhampton. Son of Christopher Bridson of 3 Selbourne Rd. Isle of Man; husband of Mary Frances Bridson of 9 St. George's Rd. Leamington Spa. Killed in Action 22 August 1918 age 33. Grave Reference: Church. C. 4635. Born at Cinder Hill, enlisted in Wolverhampton. Son of John and Harriet Burns; husband of Louisa Burns of Melton Place Moseley Village, Willenhall. Died (Mesopotamia) 21 June 1918 age 33. Born at Williton Somerset, enlisted in Wolverhampton. Son of G. T. Butler of Britannia House Old Heath, Heath Town and Rose Florence Butler. Killed in Action 7 June 1915 age 20. Memorial Reference: Sp. Mem. 11. 2nd/6th Bn South Staffordshire Regiment. Born at Wombourne, enlisted in Wolverhampton. 7th Bn. South Staffordshire Regiment. Born at Dudley, enlisted in Wolverhampton. Son of Horace J. and Fanny Castle of 300 Prestwood Rd. Heath Town. Died of Wounds 16 July 1916 age 19. Grave Reference: II. C. 29. Alfred was born in Wolverhampton in 1896, son of William H. and Mary Ann and lived at 36 Bank Street in Park Village. He was educated at St Faith’s School in Park Village. Alfred was a pre-war Territorial and before the outbreak of the war had been employed at Messrs. J. Evans and Sons in Heath Town, which manufactured pumping equipment. Alfred proceeded to France with the 1/6th Battalion and served with the Machine-Gun Section. He was killed in action aged 19 while serving in the line near Neuve Chapelle on 24 November 1915. He was originally buried close to where he was killed but his grave was subsequently moved after the war. Alfred Cheesman now lies buried at Cabaret-Rouge Cemetery: Plot XVII, Row C, Grave 5. 24th (Tyneside Irish) Bn. Northumberland Fusiliers. Formerly 177394 Royal Engineers. Son of William Richard and Frances Chidlow of 44 Dunstall Rd. Killed in Action 13 October 1917 age 34. Grave Reference: I. F. 19. Born in Wolverhampton, resident in Walsall, enlisted at Lichfield. Killed in Action 1 July 1916. Born and resident in Wolverhampton, enlisted in Willenhall. "Q" Special Coy. Royal Engineers. Born in Moseley Village, enlisted at Bilston. Son of Henry and Ann Maria Colley of Willenhall Rd, Moseley Village. Born at Liverpool, enlisted in Wolverhampton. Son of Herbert and Leah Cooke of The Bungalow, Tynwald Hill St. John's, Douglas, Isle of Man. Killed in Action 4 May 1915 age 23. 2nd Bn. Duke of Wellington's (West Riding Regiment). Enlisted and resident in Wolverhampton. Son of Thomas Cooper of 34, Dark St. Moseley Village. Memorial Reference: V. H. 3. William Cooper was born in Wolverhampton and enlisted in the South Staffords in 1895. On the outbreak of the war, he was the Regimental-Quartermaster-Sergeant of the 1st Battalion stationed at Pietermaritzburg. He returned to England in September 1914 and landed at Zeebrugge on 7 October. He was commissioned Second-Lieutenant on 7 April 1915 and posted to “C” Company. He did not take part in the Battle of Festubert between 15-18 May, being left behind with the battalion’s transport. He was in command of “C” Company when they made their attack on the Pope’s Nose Redoubt on the first day of the Battle of Loos on 25 September 1915. He led his company in the attack and was fatally wounded as he reached the German wire. He was reported to have encouraged his men despite his wounds, shouting “Come on lads, don’t give way”. Two of his soldiers dressed his wounds and went back to bring a stretcher for Cooper, but when they returned, he had died aged 38. William Cooper has no known grave and he is commemorated on the Loos Panel 73 to 76. At the time of his death, his parents lived on Prestwood Road in Heath Town, while his Edith and three children resided at 110 Milton Road. Grave Reference: I. B. 15. 10th Bn Lincolnshire Regiment Formerly 14545 South Staffs Regt. Born in 1893 at Wolverhampton enlisted in Wolverhampton. Husband of Clara Cornall. Grave Reference: V. B. 20. PONT-DU-HEM MILITARY CEMETERY, LA GORGUE. Grave Reference: Plot IIa, 7. Killed in Action 12 March 1916. Husband of A. M. Davenport, of 5, Westminster Terrace, Landon Street, Birmingham. Grave Reference VIII. I. 93. Davis, Alfred Private 34335 10th Bn Royal Welsh Fusiliers. Born and resident in Heath Town, enlisted at Maesteg Glamorgan. Panel 63 to 65. TYNE COT MEMORIAL. Deakin, Thomas Private 11690 1st Bn South Wales Borderers. He was born in 1892 at 205 Wolverhampton Road Heath Town the fourth of seven children of William Henry Deakin and his wife Elizabeth nee Wildman; he enlisted at Newport Monmouthshire 1914. Killed in Action 8 September 1916 aged 24 during the battle for High Wood Somme. Pier and Face 4 A. THIEPVAL MEMORIAL. Dickens, Alfred Private 241079 7th Bn South Staffordshire Regiment. Killed in Action 3 October 1918. Panel 6 and 7 VIS-EN-ARTOIS MEMORIAL. Eden Bert Pte 31875 8th Bn South Staffordshire Regiment. Grave Reference I. E. 11. 13th Siege Battery Royal Garrison Artillery. Born and enlisted in Wolverhampton son of Thomas Henry and Emma Jane Edge, of Heath Town. Died of Wounds 28 July 1916 aged 20. Grave Reference VII. A. 21. 1st Bn South Staffordshire Regiment. Died of Wounds 15 July 1916. Grave Reference II. B. 45. Born and enlisted in Wolverhampton, son of Charles and Mary Jane Edwards, of 1292 Willenhall Rd., Wolverhampton. Killed in Action 27 October 1914 aged 24. 8th Bn South Staffordshire Regiment. Born in Wolverhampton, resident in Wednesfield, enlisted at Hednesford. Killed in Action 23 April 1917. ARRAS Memorial Bay 6, Pas de Calais, France. Ellam William Private 9161 C Company 2nd Bn South Staffordshire Regiment. Born and enlisted in Heath Town son of Mr. and Mrs. Ellam of 8 New St., Heath Town. Killed in Action 15 November 1914 aged 21. Panel 35 and 37. YPRES (MENIN GATE) MEMORIAL. 169th Siege Battery Royal Garrison Artillery. Born in Nottingham enlisted in Wolverhampton. Died of Wounds 1 July 1918. Grave Reference P. IX. N. 1B. ST. SEVER CEMETERY EXTENSION, ROUEN. Born in Wolverhampton enlisted at Bilston. Son of Horace and Kate Emery, of 102, Wolverhampton Rd., Heath Town; husband of Martha Maria Jane Emery, of 190, Wolverhampton Rd., Heath Town. Killed in Action 6 December 1917 aged 39. Panel 4. CAMBRAI MEMORIAL, LOUVERAL. Joseph was born in Wolverhampton in 1886, the son of Joseph Eastelow. In 1901, he was living at 1 Maddox Buildings, Moseley Village, along with his father and siblings Arthur, Harriet and George and was employed as a labourer at an iron works. Joseph married Lily Goodhead in Wolverhampton in 1914. Killed in Action 31 July 1917 aged 30. Panel 39 and 41 Ypres (Menin Gate) Memorial Ieper, West-Vlaanderen, Belgium. Evans, Alfred James, Petty Officer Motor Mechanic, H.M.S. "President II. "Armoured Car Div. Alfred was born on 19 October 1889 in Harlaston, Staffordshire, the son of Joseph and Mary Ann Evans. The 1911 Census records that the family were living at 106 Wednesfield Road, Wolverhampton, along with Alfred’s siblings Gertrude and Arthur and step-brother William Hodgkins. Alfred was employed a motor driver and fitter at the Sunbeam works. He enlisted in the Royal Naval Air Service on 2 November 1914. He became a Petty Officer Motor Mechanic, serving first on the Pembroke III. He became became ill and was sent to the 19th General Hospital in Alexandria. He died from paratyphoid fever and peritonitis 6 February 1916. Grave reference : E. 21. Alexandria (Chatby) Military and War Memorial Cemetery. Egypt. Born in Heath Town, enlisted in Wolverhampton. Killed in Action 2 June 1916. Born and enlisted in Wolverhampton, son of Emma Evans of 2 Bennetts Buildings Prestwood Rd Heath Town. Grave Reference: IV.E.2. TOURGEVILLE MILITARY CEMETERY. Son of Martha Evans, of 143 Alma St. Wednesfield Rd., Wolverhampton. Killed in Action 31 August 1916 aged 27. Grave Reference II. N. 8. Born and enlisted in Wolverhampton, son of Sarah Jane Weaver of 9 Church St Heath Town. Died of Wounds 20 October 1915 age 21. Born at Mansfield enlisted in Wolverhampton. Son of Mrs. Evers, of 35, Bank St., Cannock Rd., Park Village, Wolverhampton; husband of Elizabeth Evers. Killed in Action 27 April 1917. Grave Reference III. A. 10. DICKENBUSCH NEW MILITARY CEMETERY EXTENSION. 1st Bn Queen’s (Royal West Surrey Regiment) KIA 3/11/16. Born in Heath Town, enlisted in Wolverhampton, son of William and Maria Faulkner, of 38, Paul St., Heath Town. Killed in Action 3 November 1916 age 22. Pier and Face 5 D and 6 D. THIEPVAL MEMORIAL. Son of John and Esther Fletcher of 34 Church Lane, Wolverhampton; husband of Hannah Fletcher of 6 Dean St., Heath Town, Wolverhampton. Died (Ireland) 27 April 1916. “C” Bty 295th Bde Royal Field Artillery. Son of Mrs. Martha Francis of 2121, Chapel St. Moseley Village, Wolverhampton. Killed in action 21 March 1918 aged 23. Killed in Action 8 August 1916 aged 22. Son of David and Alice Freeman of I Victoria Rd. Wednesfield. Memorial Reference: Pier and Face 1 A and 8 A. Born in Wolverhampton in 1894 son of William and Ellen Frost of 2 Railway St. Heath Town, Wolverhampton, employed as a tinmans labourer. Enlisted in Wolverhampton; Killed in action 21 October 2017 aged 23. Grave Reference I. D. 14. 9th Service Bn (Pioneers) South Staffordshire Regiment. Born in 1888 at Wednesbury, son of Peter and Emily Gatliffe. Enlisted in Wolverhampton, died of wounds 26 May 2016. Grave Reference I. F. 42. Son of Robert and Elizabeth Genner of 11 Church St Heath Town, Wolverhampton. Killed in Action 13 October 1915. “A” Company 1/6th Bn South Staffordshire Regiment. Born in 1890 in Wolverhampton married Priscilla Brown in 1913. Born in 1897 in Tettenhall Wolverhampton son of son of Eliza Gough of 104 Wolverhampton Rd. Heath Town. Employed as a rabbit trap maker. Killed in Action 29 December 1914. 1st Bn. Lancashire Fusiliers attached to 86th Trench Mortar Bty. Born in Bulwell Nottingham 15th March 1894 son of Alfred Carter (born Portobello Willenhall) and Elizabeth Gough (born Bulwell Nottingham). It appears that his parents were not married, and Thomas therefore had his mother’s surname. By 1911 he was living with his father, step mother and half siblings Jack, Polly and Frank at 3 Roman Yard Quarry Road, Bulwell, he was employed as a pot maker. At some point after 1911, and before he enlisted in the South Staffordshire Regiment in Lichfield, Thomas moved to Moseley Village, possibly to live with friends or relatives of his father and from where he enlisted into the South Staffords at Lichfield. Thomas married his first cousin, Elsie May Carter, daughter of his father's brother, James Carter in 1916 in Wolverhampton. Thomas was Killed in Action at Celery Copse, a small wood just south of Merris, Strazeele Area Northern France, 12th August 1918 aged 24. In his ‘soldiers’ effects’ he left six pounds. Outtersteene Communal Cemetery Extension, Bailleul Nord, Pas-de-Calais, France. John was born in Wolverhampton in about 1886, the son of James and Lucy Green. In 1901 they were living at 92 Grove Street, Heath Town, along with John’s older sister Elizabeth and younger sisters Sarah and Annie. John was employed as a forge mill labourer. John Died of Wounds 18th July 1918, He was awarded the Military Medal as reported in the London Gazette dated 18th October 1918. Grave reference: III. B. 26. RUE-PETILLON MILITARY CEMETERY, FLEURBAIX, Pas de Calais, France. John was born in Wolverhampton in 1891, son of Charles and Sarah Griffiths. By 1901 they along with John’s older brother Noah, younger brother William and younger sister Elizabeth were living at 141 Deans Road Moseley Village. John was Killed in Action at Hill 60 Belgium 23rd September 1915 aged 23. Grave reference: I. L. 4. John was born in 1899 in Wolverhampton son of John Joseph and Alice Griffiths. By 1911 they along with John’s younger siblings Gladys, Frank, Gwendoline, Albert, Herbert and Reginald were living at 47, Cannock Rd., Park Village, Heath Town. In his ‘soldier’s effects’ he left to his mother, six pounds, nineteen shillings and six pence. John was Killed in Action 2nd January 1918 aged 19. Grave reference: III. B. 1. PHILOSOPHE BRITISH CEMETERY, MAZINGARBE, Pas de Calais, France. Born 3rd April 1885 in Woolwich, London son of Thomas and Maria Hall. In 1901 they along with William’s older siblings Henry and Charles and younger siblings Esther, Lilian, Albert, Mabel, Maud and Arthur were living at 12 Pendrell Street, East Plumstead, London. By 1910 William is living in Wolverhampton and marries Alice Florence Morgan. In 1911 the couple along with their 11-week-old daughter Kate Elizabeth were living at 8 Bridge Street, Cannock Rd, Heath Town. William was employed as a labourer emptying pig-iron lifter trucks. William was Killed in Action 1st July 1916. Bernard was born in 1891 in Wolverhampton, son of John and Phoebe Harman. In 1911 they along with Bernard’s younger sister May were living at 327 Prestwood Road, Fair View Cottage, Heath Town, John was employed as a gas fitter. In his ‘soldier’s effects’ he left to his father seven pounds, thirteen shillings and one penny. Bernard was Killed in Action 13th October 1915. Grave reference: VII. C. 2. CABARET-ROUGE BRITISH CEMETERY, SOUCHEZ, Pas de Calais, France. 2nd Royal Marines Bn. R.N. Division Royal Marine Infantry. Norman was born 18th September 1894 at Brierley Hill, Stourbridge son of Harry and Margaret Harper, of "Ashley Mount," Prestwood Rd., Wolverhampton. In 1911 he was employed as a warehouse man. Norman enlisted 29th July 1912, he was Killed in Action 26th October 1917 aged 23. Panel 1 and 162A. TYNE COT MEMORIAL, West-Vlaanderen, Belgium. Hayward William Glenfred Private 10045 MM "A" Coy. 2nd Bn. South Staffordshire Regiment. Born 1890 at Wellington Shropshire son of John and Elizabeth Hayward. William had two older sisters Annie and Fanny and a younger brother George. The 1911 census records that William was employed as a Railway dining car assistant cook, his father was employed as a railway guard and his sister Fanny was employed as an ink tin maker. The family were living at 55 Cannock Road Park Village. William was killed in action 30 November 1917. Panel 7 CAMBRAI MEMORIAL, LOUVERVAL, France. Hugh was born in 1898 in Wolverhampton son of Emma Hedgecox and Hugh Thornton. By 1911 Hugh was living with his mother and elder brother George at 107, Grove St., Heath Town. Hugh was Killed in Action 27th August 1917 aged 19. Panel 72 to 75. TYNE COT MEMORIAL, West-Vlaanderen, Belgium. Frank was born 1892 in Summerhill, Tipton son of George and Florence Hickman. By 1911 Franks’ mother was widowed, they along with Frank’s younger siblings George, Bessie and Frederick were living at 10 Heath Street, Heath Town. Frank was employed as a boot repairer. Frank enlisted at Darlaston in 1915 and was Killed in Action 18th August 1916 aged 22. Pier and Face 6 B. THIEPVAL MEMORIAL, Somme, France. Esau was born in 1896 in Wolverhampton, son of Esau and Sarah Annie Higgins. By 1901 they were living at 23 Chapel Street Moseley Village with Esau’s siblings Edward and Florence and Esau’s paternal grandfather Edward. Esau senior was employed as a blacksmith in the iron fencing trade. In 1911 the family are living at 86 Deans Road, Moseley Village, with the addition of Esau's siblings, Sidney, Harold, Doris and Leonard, unfortunately Esau’s sister Florence died in 1903. Another sister, Hilda, was born in 1912 .Esau was employed as a shop assistant for a tailor. Panel 90 to 92 and 162 to 162A. TYNE COT MEMORIAL, West-Vlaanderen, Belgium. Joseph was born in Wolverhampton in 1893 son of Frederick and Charlotte Hilditch. By 1911 Joseph was living at 23 Paul St, Heath Town with his widowed mother, older brother Albert and younger siblings Charles and Alfred. He was employed as a bottler at a brewery. Joseph was Killed in Action 24th June 1917. In his ‘soldier’s effects’ he left 10 pounds, three shillings and nine pence. Grave reference: XVIII. F. 9. LOOS BRITISH CEMETERY, Pas de Calais, France. John was born in Portobello, Willenhall, in about 1892, the son of Thomas and Elizabeth Hill. His father, Thomas, died in 1897, and his mother married Richard Ford, in 1898. By 1911 the family including John’s sister Sarah and half siblings Edwin, Lily and Ernest were living at 76 Moseley Village, Willenhall Road. John was employed as a horse shoe stamper. John first served in France from 1 August 1915. He was wounded and returned back to Britain, where he died of his wounds in the 1st Northern Hospital in Newcastle on Tyne, 21st February 1917 aged 25. John’s body was returned to Heath Town and buried at HEATH TOWN (HOLY TRINITY) CHURCHYARD, grave reference NG. 10. 31. Leonard was born in 1885 in Great Wyrley, Staffordshire son of Isaac and Martha Ann Hinks. By 1911 they along with Leonard’s older brother Thomas and younger siblings George, Gladys and Norman were living at 84 Milton Road, Heath Town. Leonard was employed in ‘safe making’. Leonard was Killed in Action 21st April 1917 aged 21. In his ‘soldier’s effects’ he left to his father thirteen pounds, eleven shillings and eight pence. Bay 10. ARRAS MEMORIAL, Pas de Calais, France. Frederick was born in 1887 in Peckham, London, son of Phillip and Elizabeth Hinson. In 1901 they along with Frederick’s older sisters Elizabeth and Emily and younger brothers Walter, Alfred and John were living at 12 Cator Street Peckham, London. In 1910 Frederick was renting a unfurnished room at 74 Cator Street, Peckham. Later in 1910 he married Ellen Elizabeth Monk in Wolverhampton and by 1911 they were living at 129 Leslie Rd, Heath Town, Frederick was employed as a safe maker. Frederick Died of Wounds 19th August 1916 at No. 38 Casualty Clearing Station France, aged 29. He left in his will to his wife Ellen who at that time was living at 27, Park Lane, Park Village, one hundred and seven pounds, fourteen shillings and five pence. In his ‘soldier’s effects’ he left to her one pound, six shillings and three pence. Grave reference: III. D. 48. HEILLY STATION CEMETERY, MERICOURT-L'ABBE, Somme, France. Edwin was born in Wolverhampton in 1882 son of Robert and Mary Hodgkiss. In 1891 they along with Edwin’s three older siblings Mary, Isabelle and Robert and younger siblings Samuel and Mary were living in New Street Heath Town. Edwin married Alice Gertrude Pickering 1st August 1904 in Wednesfield. In 1911 they were living at Rear Back, 18 Church Street, Heath Town with their three children Doris, Gertrude and Ivy. Edwin was employed as a blacksmith at a steel tubes company. Edwin landed in France 20th October 1915 he was Killed in Action 14th September 1916 aged 34. Pier and Face 8 D. THIEPVAL MEMORIAL, Somme, France. Theo was born in Wolverhampton in 1893 son of Edmund George and Mary Hodson. In 1911 they were living at 17, Grove St., Heath Town along with Theo’s older brother Edmund and younger siblings Septimius, Ethel, Dora and Eva. Theo was employed as press tool setter at a washer manufacturer. Theo landed in France 5th October 1915, he Died of Wounds 19th July 1916. Grave reference: VIII. A. 128. BOULOGNE EASTERN CEMETERY, Pas de Calais, France. Ernest was born in Wolverhampton in 1879 son of Samuel and Harriet Hopwood, in 1881 he was living in Coventry Street with his parents and older siblings Harriet, Joseph, William, Albert, Agnes, Alice, Arthur and Emma. In 1891 Ernest is living at 366 Wolverhampton Road Heath Town with his mother and brothers Albert and Arthur, his father passing away earlier in the year. Ernest married Mary Ann Tonks in 1908 in Wolverhampton, by 1911 they had two children Albert and Alice and were living at 9 Hill St, Heath Town. Ernest was employed as a railway goods porter. In his ‘soldier’s effects’ he left Mary Ann twelve shillings, 13 pence. Ernest was Killed in Action 30th May 1916. Grave reference: III. C. 15. Thomas was born in Wolverhampton in 1890 son of John and Margaret Hopwood, in 1901 they were living at 12 Miner Street, Wolverhampton with Thomas’ three older siblings Joseph, Mary, Jennie and younger brother Harry (also remembered on this memorial). By 1911 Thomas is a regular soldier serving with the 1st Bn. South Staffordshire Regiment. Thomas was Killed in Action 28th October 1914 aged 24, at this time his parents were living at 25, New St., Heath Town. Panel 35 and 37. YPRES (MENIN GATE) MEMORIAL, West-Vlaanderen, Belgium. 2nd Bn. South Staffordshire Regiment. Harry was born in Wolverhampton about 1896 son of John and Margaret Hopwood, in 1901 they were living at 12 Miner Street, Wolverhampton with Harry’s older siblings Joseph, Mary, Jennie and Thomas (also remembered on this memorial). By 1911 he was living with his parents and sister Jennie at 29 New St, Heath Town and was employed as an edge tool comp finisher. Harry was Killed in Action 25th September 1915. Grave reference: C. 2C. CAMBRIN MILITARY CEMETERY, Pas de Calais, France. Robert was born in Kidderminster, resident in Wolverhampton and enlisted at Liverpool. Panel 4 and 6. YPRES (MENIN GATE) MEMORIAL, West-Vlaanderen, Belgium. Albert was born in Bilston about 1898 son of Alfred and Annie Howell they were living at 5 Rough Hills, Ettingshall along with Albert’s elder siblings, Amy and Alfred and younger siblings Beatrice and Winnie. At the time of his enlistment Albert was recorded as being resident in Heath Town. Albert was Killed in Action 12th February 1916. Panel 46 - 48 and 50. YPRES (MENIN GATE) MEMORIAL, West-Vlaanderen, Belgium. Hudson, Harold Edward, Private 7405 3rd Bn. Worcestershire Regiment. Born in Wolverhampton in 1886 son of John and Mary Hudson, he married Lucy Clift in 1906. The 1911 Census records Harold and Lucy living at 51 Bank Street, Park Village, Heath Town and Harold being employed as a railway carriage cleaner. Harold was Killed in Action 12 March 1915 aged 28. Panel 34. Ypres (Menin Gate) Memorial Ieper, West-Vlaanderen, Belgium. John was born in Wolverhampton in 1889 son of John and Elizabeth Hurlston, in 1901 he was living with his parents in Deans Road Moseley Village. By 1911 John is a regular soldier serving with the 1st Bn. South Staffordshire Regiment. At the time of his death his parents were living at 92, Grove St., Heath Town. John was Killed in Action 26th October 1914 aged 25. Wesley was born in 1887, the son of Edward and Mary Ann Jenkins. In 1901 they were living at 6 Merridale Road Wolverhampton along with his older brothers Charles and Frederick. By 1911 Wesley was living at 79 Bath Street with his parents and Frederick and was employed as an auctioneer’s assistant. Wesley enlisted into the Army, 10th February 1916, at that time he was employed as a clerk and collector. Wesley was posted to the 11th (Service) Battalion 8th April 1916. After arriving home on 7th June 1918 on leave from Italy he was admitted to Wolverhampton General Hospital 10th June and died 12th June of pneumonia aged 31. In his ‘soldier’s effects’ he left his father six pounds, two shillings and eight pence. Wesley was buried 15th June 1918. Grave reference: OG. 25. 13. 1st Bn. Hampshire Regiment (formerly 17092 Duke of Cornwall’s Light Infantry). David was born 2nd March 1899 in Willenhall, son of David and Ann Johnson who in 1911 were all living at 6 Railway Street, Willenhall, along with David’s younger brothers Horace and Ernest. At the time of David’s death his mother was recorded as living at 26, High St., Moseley Village, Heath Town. David Died of Wounds 10th October 1917 aged 19. ST. SEVER CEMETERY EXTENSION, ROUEN, Seine-Maritime, France. D Company, 1st Bn. Canadian Infantry. Born in Wolverhampton 27th November 1886. Attested 16 April 1915 at Hamilton Ontario, Canada. The document records that Joseph was 5'8" tall with dark hair, brown eyes and a Methodist. His trade was a mechanic. Joseph was admitted into No1 South African General Hospital, Abberville France, 5th May 1917 with a gunshot wound to his spine. He was transferred 18th May 1917 to 1st South General Hospital, Edgbaston, Birmingham. He died of his wounds at 11.50pm, 5th June 1917. Grave reference 23087. Wolverhampton Cemetery. David was born about 1882 in Ebbw Vale, Monmouthshire, the son of Samuel and Emily Jones. By 1911, David was living with his widowed mother and brother, Thomas at 168 Willenhall Road, Moseley Village, Wolverhampton. He arrived in the Balkans 25th May 1915. Killed in action 28th June 1915 in Gallipoli. Panel 85 to 93 or 220 to 222. HELLES Memorial, Turkey (including Gallipoli). Born in Blakenhall, Wolverhampton 1898 son of Thomas and Ellen Jones. The 1911 census records that he, his parents and his younger sister Annie were living at 44, Bridge St., Park Village, Wolverhampton. Harry was Killed in Action 31st October 1916 aged 19. Pier and Face 5 A and 6 C. Theipval Memorial, Somme France. James was born in Wolverhampton in 1892 son of James and Jessie Jones. In 1911 he was living at Rear Of 212 Wolverhampton Road, Heath Town, with his mother, older brother John, sister Eunice, her husband Frederick and their baby son John Henry. No employment is recorded for James in the 1911 census. James was Killed in Action 18th May 1915. Panel 21 and 22. LE TOURET MEMORIAL, Pas de Calais, France. Born in Wolverhampton about 1884, son of William Jones, of 25, Heath St., Heath Town, Wolverhampton; husband of Muriel Olive Jones, of 9, Barlow Terrace, Donore Avenue. Dublin. Killed in Action 11th April 1917 aged 23. Grave Reference II. E. 13. Jeancourt Communal Cemetery Extension, Aisne, France. Matthew was born in Wolverhampton in 1884 son of John and Louisa Jones. In 1911 he is living with his brother Albert, Albert’s wife Hannah and their father John at Old Heath, Heath Town; he is employed as a trunk maker. Matthew died 26th December 1917. He is recorded as ‘died’ which indicates that he died of an illness or accident and not through wounds received in combat. The cemetery Matthew is buried in was at the time near to No.8 General Hospital, which was quartered at Bois-Guillaume in a large country house and grounds. BOIS-GUILLAUME COMMUNAL CEMETERY EXTENSION, Seine-Maritime, France. Married Maude Jones in Wolverhampton in 1900. Enoch was born in Wolverhampton in 1894 son of George and Hannah Latham. George died in 1903 and Hannah remarried Samuel Phillips in 1904. In 1911 they are living at 40 Grove Street, Heath Town along with his siblings Thomas, Elizabeth and Hanna, half siblings Harold and Clara and step brothers Joseph and Samuel. Enoch was employed as a mill hand at the local iron works. Enoch was Killed in Action 24th November 1915 aged 20. In his ‘soldier’s effects’ he left his mother four pounds, nine shillings and five pence and to his brother Thomas fourteen shillings and eleven pence. Panel 73 to 76. LOOS MEMORIAL, Pas de Calais, France. Born in Wolverhampton about 1883, son of William and Phoebe Law. Married Gladys Law (née Adams) in Wolverhampton 31st March 1902, they had three daughters, Edith, Lily May and Florence. The 1911 census records the family living in Elsmere Port Cheshire and Joseph employed as warehouse packer. Joseph attested at Birkenhead 1st September 1914 into the Cheshire Regiment. He died 20th October 1914 of pneumonia in the Royal Infirmary Cheshire aged 31, leaving Gladys in his ‘soldier’s effects’ one pound five shilling and two pence. By March 1915 Gladys and the girls were back in Wolverhampton living at 12 Newport St. Park Village. Albert was born in Wolverhampton in 1888 son of Matthew and Louisa Lawrence, in 1901 the family were living at 67, Heath St., Heath Town, along with Albert’s older brothers Arthur and William and younger siblings Matthew, John, Percy and Amy. By 1911 Albert is a regular soldier having enlisted at Lichfield Staffordshire. Albert Died of Wounds 27th October 1914 aged 26. In his ‘soldier’s effects’ he left to his father seven pounds, four shilling and eleven pence. YPRES TOWN CEMETERY, West-Vlaanderen, Belgium. Alexander was born in Wolverhampton in 1899, the son of Luke and Mary L. Lawrence. In 1911, they were living at Laurel Villa, Tudor Road, Heath Town with Alexander’s siblings Martha Helen, Frank, Violet, Mary, May, Eva, Archibald and Winnifred. Alexander was Killed in Action 12th May 1918. George was born in 1898 in Park Village Wolverhampton son of John Samuel and Elizabeth Lee, of 17, Bridge St., Park Village, Wolverhampton where the 1911 census records, he lived with his older sisters Rose and Maud, an older brother Alfred and three younger brothers John, Arthur and Sydney. George died shortly before 10am on the morning 10th October 1918 aged 20 when RMS Leinster the Kingstown to Holyhead mailboat that he was on was torpedoed and sunk by German submarine UB-123, while bound for Holyhead. She went down just outside Dublin Bay at a point 4 nautical miles east of the Kish light. The ship's log states that she carried 77 crew and 694 passengers on her final voyage under the command of Captain William Birch. Those on board included more than one hundred British civilians, 22 postal sorters (working in the mail room) and almost 500 military personnel from the Royal Navy, British Army and Royal Air Force. Also aboard were nurses from Britain, Ireland, Australia, New Zealand, Canada and the United States. The exact number of dead is unknown but is believed it was at least 564. George’s body was not recovered, in his ‘soldier’s effects’ he left three pounds five shillings and eleven pence. Killed in Action 23rd November 1916. Pier and Face 7 B. Theipval Memorial, Somme France. Born in Wolverhampton in 1896, son of Edward and Sarah Lewis. In 1911 he was living with them at 20 New St, Heath Town, along with his older sisters Agness and Leslie, younger sister Ruth and younger brother Willie. In 1912 he enlisted into 6th Bn. South Staffordshire Regiment a Territorial Battalion, at that time John was employed as a fitter at Jenks & Cattell. He was embodied in 1914 but was discharged as medically unfit for military service 19th May 1915. At some point he reenlisted into the Army. John was Killed in Action 4th November 1918. SEBOURG BRITISH CEMETERY, Nord, France. Rowland was born in Wolverhampton in 1895 son of John and Caroline May Lewis. In 1911 they were living at The Verlands, Prestwood Rd., along with Rowland’s older siblings Priscilla and John, younger siblings Caroline and Jessie and their maternal grandmother Priscilla Clements. Rowland was employed as a ‘learning’ trunk maker. Rowland died of illness or disease 30th August 1917. Grave reference: XVI. N. 10. Lloyd, William Henry, M/33834(CH) Engine Room Artificer 4th Class, HMS Pembroke Royal Navy, enlisting 2 September 1918. HMS Pembroke was a shore training establishment - the Royal Navy Barracks at Chatham. William died of pneumonia 26th October 1918 aged 27. Grave Reference: NG 11. 5. Heath Town (Holy Trinity) Churchyard. John was born in Wolverhampton in 1897 son of Joseph and Alice Lovett, in 1911 they were living at 27, Powell St., Park Village, along with his older sisters Rosannah and Alice older brother Joseph, younger brothers Percy, William, Albert, George and younger sister Elsie. Bay 6. ARRAS MEMORIAL Pas de Calais, France. Walter was born in Wolverhampton in 1876 son of Henry and Elizabeth Lucas. In 1891 they were living at 189 Dudley Road along with Walter’s older brother Joseph and younger sisters Amy and Florence. By 1911 Walter is a regular soldier and is serving with 4th Bn. South Staffordshire Regiment (Special Reserve) based at Burntwood with the rank of Serjeant, he is still single. Lucas landed in France 6th July 1915 he was Killed in Action 15th July 1916. Pier and Face 7 B. THIEPVAL MEMORIAL, Somme, France. Born in Wolverhampton about 1890 son of Thomas and Lydia Marsh. Lydia passed away in 1900 and in 1901 Thomas is living with his father and younger brother William in Shrubbery St. off the Willenhall road. By 1911 Thomas is a regular soldier with the 1st Bn. South Staffordshire Regiment based in Gibraltar. Thomas landed in France with the Battalion 4th October 1914. He was Killed in Action 7th November 1914. Born in Wolverhampton, enlisted at Dudley. Killed in Action 8th November 1914. Panel 34. YPRES (MENIN GATE) MEMORIAL, West-Vlaanderen, Belgium. Benjamin was born in Moseley Village, Wolverhampton about 1896 son of John and Rosehannah Martin. In 1911 they were living at 31 High Street, Moseley Village, Heath Town along with Benjamin’s older brother John and younger siblings Phoebe, Gladys, Rhoda and William. Benjamin was employed as a nut and bolt maker. Benjamin was Killed in Action 20th July 1916. Pier and Face 10 C. THIEPVAL MEMORIAL, Somme, France. Benjamin was born 1895 in Moseley Village, the son of John Henry and Roseanna Martin. In 1911 they were living at 31 High Street, Moseley Village, Heath Town, along with Benjamin’s older brother John, younger sisters Gladys, Elizabeth, Rhoda, Florence and younger brother William. Benjamin worked as a nut and bolt maker. Pier and Face 10 C 10 D and 11 A.
Bert was born in Wolverhampton about 1890 son of Edward and Mary Ann Mattox. In 1901 they along with Bert’s younger brother Frank were living in the High Street Wednesfield. In 1911 Bert was living with his mother only at 3 Court, 2 High St, Wednesfield, he was employed as an ink maker. Frank was killed in action 27 October 1914 serving with 1st Bn South Staffordshire Regiment. Bert married Louisa Kennett in 1913 and they had two sons Bert born in 1914 and Horace born in 1917. At the time of Bert's death Louisa was living at of 21, Paul St., Heath Town. Bert was Killed in Action 23rd September 1917 aged 28. 9th Bn. North Staffordshire Regiment. Thomas was born in Tewkesbury in 1879 son of Thomas and Ruth Midwinter. In 1901 they along with Thomas’s older brother Francis and younger siblings Ruth, William, John, Enoch and Edwin were living at 120 Bushbury Road, Heath Town. Thomas married Fanny Roberts in Wednesfield 22nd February 1903 and by 1911 they were living at 79 Pottery Street, Castleford, Yorkshire; Thomas was employed as coal miner like his father. Living with them was their daughter Fanny who was born in Castleford in 1907. They had a son Thomas born in 1912. Thomas died of illness or an accident 28th October 1914 aged 35 as he never served abroad. SEAFORD CEMETERY, Sussex, United Kingdom. Andrew was born in Dudley about 1889 son of Andrew and Caroline Miles. In 1891 they and his older sisters Jane, Minnie and Gladys were living at 43 St. Johns Street, Kates Hill, Dudley. By 1901 the family have moved to Church Villas Cannock Road Wolverhampton. Andrew senior died at 68 Cannock Road 21st July 1908 leaving £50 in his will. By 1911 Andrew was a regular soldier serving with the Coldstream Guards and based at Victoria Barracks, Victoria Street, Windsor. Andrew died 25th January 1915. Panels 2 and 3. LE TOURET MEMORIAL, Pas de Calais, France. Edward was born in 1885 in Wolverhampton the son of Robert and Hannah Millington. In 1901, they were living at 12 New Sun Street, together with Edward’s brother Fred and sisters Gertrude and Martha. He married Margaret Skelton in 1911, and their son William was born in 1912. The family lived at 74, Prosser St., Park Village, Wolverhampton. Edward was employed an ink grinder at Mander Brothers Limited. Edward died of wounds 11 November 1917 aged 32. Grave Reference: II. G. 3. MENDINGHEM MILITARY CEMETERY, West-Vlaanderen, Belgium. Minor Victor George Pte 41941 “C” Coy Leicestershire Rgt KIA 27/5/18. Noakes Thomas Pte 15378 1st Btn South Staffordshire Rgt KIA 1/7/16. Payne William Henry Pte 19782 1st Btn South Staffordshire Rgt KIA 12/5/17. Grave Reference I. M. 66. Born at Dudley in 1899, son of William and Martha Phillips. The 1911 census records them along with Georges' older brother William, older sister Amy and a younger brother Spencer living at 63 Prosser Street, Park Village, Heath Town. George died 13th April 1919. Grave reference: XIV. A. 13. Died of Wounds 28 September 1918. Killed in Action 11th April 1918. Panel 5. PLOEGSTEERT MEMORIAL, Hainaut, Belgium. Rabone, James Thomas, Private 40166. Born in Wolverhampton about 1877, son of James and Margaret Rabone. He married Agnes Welch in Wolverhampton in 1902. The 1911 census records them living at 20 Heath St. Heath Town with their three children Florence, Thomas and Agnes. James is employed as a maltster at a local works. In 1913 they have another son William. James died of wounds 25th May 1918 aged 41. Grave reference: III. D. 40. PHILOSOPHE BRITISH CEMETERY, MAZINGARBE. Pas de Calais, France. Born in Wolverhampton in 1884 son of Thomas and Mary Ann Ralph née Mears. In 1906 he married Bertha Harrison in Wolverhampton. The 1911 census records that they were living with Bertha’s parents Benjamin and Jemina at 241 Wolverhampton Road, Heath Town with their two children Matthew and Ernest. Matthew was employed as Labourer in cast iron and Bertha was employed blanking iron washers. In 1913 they have another son Percy. Matthew was Killed in Action 31st October 1916, Grave reference: XIII. G. 7. SERRE ROAD CEMETERY No.2. Somme, France. Randle, Percy Enos, Corporal 292849 (formerly W.R. 310371) Royal Engineers. Born in Wolverhampton 24th November 1888 son of Enos and Mary Randle née Cartwright. The 1911 Census records that Percy was living with his parents at 271 Oscott Cottage, Prestwood Road, Heath Town and was employed as an engineer’s clerk. He married Kate Evelyn Trewhitt 26th August 1915 in Sunderland. Percy enlisted into the army at Glasgow 24th July 1917, at the time he was employed as a musical hall agent. He was living c/o Collins 115 Renfield Street Glasgow, Collins was Scotland’s first successful Variety Agency. In Percy’s attestation record he is recorded as being 5’ 7” tall, he was given the medical classification of C which is “free from serious organic diseases, able to stand service in garrisons at home” and the subcategory C1 “able to march 5 miles, see to shoot with glasses, and hear well.” His wife Kate was living at 9 Fordland Place, Hylton Road Sunderland. By 5th December 1917 he had been promoted to the rank of Lance/Corporal and two days later to Corporal. He appeared at a medical board held 11th March 1918 and was deemed unfit for further service, on 1st April 1918 Percy was discharged from the army as being no longer fit for war service. He was awarded the Silver War Badge number B270248. Percy died 19th June 1918 at 107 Hill Street, Garnethill, Glasgow of laryngeal and pulmonary tuberculosis. His will records that he left £69 6 shillings and 2 pence.